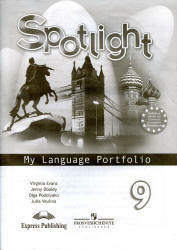 Spotlight 9 (Английский в фокусе. 9 класс) Языковой портфель. Ваулина Ю.Е. 4-е изд. - М.: 2017 - 54 с. You can include in your Language Portfolio almost anything you have produced or collected that proves your progress in English. We suggest you keep your work in plastic envelopes so that it remains in good condition. In practice, your Language Portfolio can be in any shape or size according to the material you choose to store.